As a member of the Good Housekeeping Reader Product Test Panel, I was sent some Ocean Spray products to review. 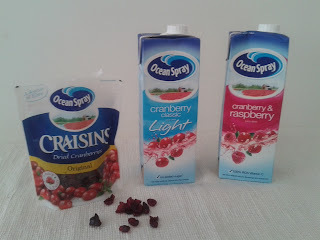 I enjoyed the Craisins on my branflakes - better than raisins! The juices were quite refreshing, slightly tangy, and felt like a healthy option. They also included some recipes which I have adapted slightly below, and I would like to thank Good Housekeeping for giving me the opportunity to try something new. These were delicious, but if you don't like raisins in your brownies, you won't like Craisins either. Loved the nuts though. 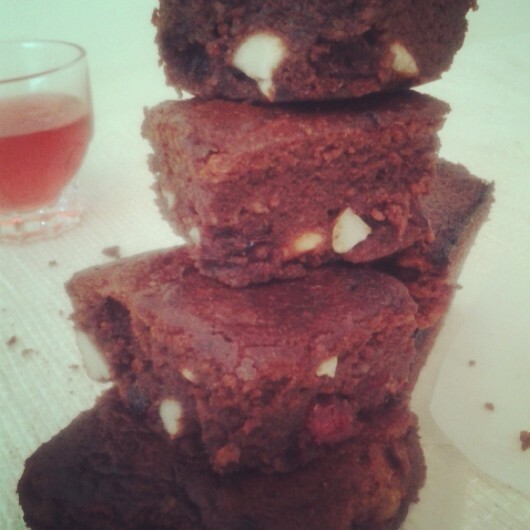 And by beating the egg whites separately, they were a lot lighter than my usual brownies. Preheat the oven to gas 6/7 and grease a square tin. Melt the chocolate and butter in a bain marie. Mix together the sugar, egg yolks and flour, then add the melted chocolate and butter. Beat the egg whites until stiff and then add a pinch of salt. Gently fold the egg whites into the mixture with a spatula and then add in the Craisins and cashews. Pour into the tin and bake for about 20 minutes. This was delicious, my little boy loved it! He tried the juice on its own as well, and liked it, but really loved the sorbet. I made so much that it melted slightly after a while, but that was easily remedied, by adding some vodka to make a sweet and juicy cocktail. Obviously not for him! Time: 30 mins to prepare plus overnight to freeze. Pour the cranberry juice into a saucepan with the sugar. Heat until all the sugar dissolves and then cool the syrup over iced water until cool. Add the orange and lime juice. 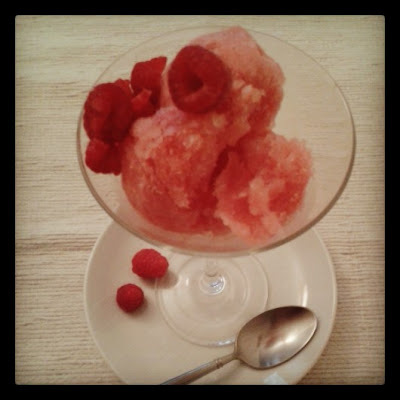 Pour the sorbet into a freezer-proof container and freeze for an hour. Add the egg white and whisk with a fork. Return the the freezer, taking it out every hour or so to mix it so large crystals don't form. Use an ice cream scoop to place in a dessert bowl. Serve with some fresh raspberries. 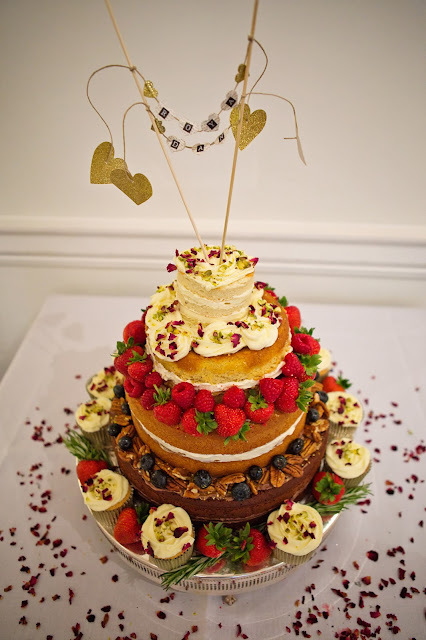 Again, this was very popular with my little boy, although he didn't go for the fresh raspberries. Quite tangy, especially with the raspberries. 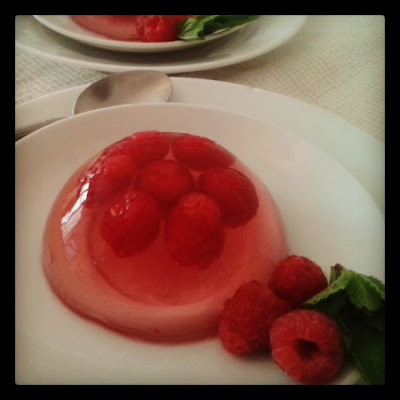 Homemade jelly - who knew it was so simple! Heat the water and sugar in a small saucepan over a medium heat, and stir until the sugar dissolves. Bring to the boil then simmer for 5 minutes, then leave to cool. Soak the gelatine leaves in cold water for 5 minutes. Squeeze out the water then add to the sugar syrup. Once the gelatine has dissolved, add the cranberry and raspberry juice and whisk to combine. Place a small handful of raspberries in the bottom of 4 ramekins. Cover with the jelly mixture until just a the top of the fruit, before they start to float. Place in the freezer for about 10 minutes until set. Remove from the freezer and pour over the rest of the jelly mixture. Leave in the fridge to set (overnight is best). To serve, place each ramekin in a bowl of hot water for about 10-15 seconds, then turn out onto a plate. Thank you Fiona! The sorbet was really delicious, specially with the vodka! Your jelly is very, very pretty indeed!